Whether from pregnancy, aging, weight fluctuation, or heredity, many are unhappy with excess skin and fat on their abdomen. A tummy tuck, or “abdominoplasty,” can resolve these issues to create a more contoured, youthful shape. Unlike liposuction, which only removes excess fat without tightening the skin, the tummy tuck procedure will eliminate excess fat as well as sagging skin and in most cases will restore weakened or separated abdominal muscles. Unwanted stretch marks can also be removed during the surgery if they are located on the skin that will be excised. If you are unhappy with excess skin and fat on your stomach, you may be a candidate for a tummy tuck in Daytona Beach. Those who are considering the procedure are physically and mentally healthy, maintain a stable weight, are finished having children, have realistic expectations for the procedure, and do not smoke. Those considering tummy tuck surgery should note that there will be some scarring with the procedure, but tummy tuck scars can typically be concealed beneath a bathing suit or underwear. Results with tummy tucks are technically permanent, but they may be influenced in the future by significant fluctuations in weight or by pregnancy. In order to develop an idea of what to expect from a tummy tuck in Florida, view Dr. Samson’s tummy tuck before and after photos. There are a few options available for the tummy tuck procedure. A traditional tummy tuck usually includes an incision at the navel and along the pubic hairline. Excess fat and skin are removed from the abdominal area, and the abdominal muscles are often tightened. For those who wish to have less recovery time and a shorter scar, a mini tummy tuck can be performed. A mini tummy tuck involves liposuction of the excess fat and the removal of skin from the lower portion of the abdomen. The muscles are not usually tightened but can be if necessary, and there is no incision made in the navel. Excess fat and skin on the abdomen does not exclusively occur on women. A male tummy tuck also improves the appearance of the abdomen by removing excess skin and fat and tightening the underlying muscles. Incisions are made across the pubic hairline from hip to hip as well as at the navel. The skin is stretched over the new abdominal structure for a more sculpted shape. When a patient is unhappy with their upper hips or “love handles,” an extended tummy tuck can be performed. Incisions with an extended tummy tuck are the same as a traditional tummy tuck but also extend around the flanks. Excess fat and skin are removed, resulting in a flatter stomach and smoother hip contour. In many cases, liposuction can safely be combined with a tummy tuck in a modification known as “lipoabdominoplasty”. This can address areas of unwanted fat in the abdominal area, while removing excess skin during the same procedure. Tummy tuck surgery is usually performed under general anesthesia. For a traditional tummy tuck, an incision will be made from hip to hip along the pubic hairline. The incision line will vary in length depending on the level of correction necessary. Through this incision, the abdominal muscles will be tightened and sutured together, and excess fat will be suctioned out. A second incision will be made around the navel to remove excess skin from the upper abdomen or to reposition the navel if necessary. Incisions will be closed with sutures or skin adhesives. You should prepare for your tummy tuck recovery ahead of time by arranging to have someone care for you for the first 48 hours after surgery. You should also arrange to spend at least two weeks away from work and other commitments. Bandages will dress your incisions, and a small drainage tube may be inserted under the skin to remove any excess fluid or blood. You will be given specific instructions for how to care for the incisions and drains, and you may be instructed to wear a compression garment. This will reduce swelling and help your body adapt to its new shape. The recovery time for tummy tuck surgery varies depending the extent of the surgery. Typically, swelling and bruising will subside after three weeks but can last up to six months. Maintaining a healthy diet and staying hydrated can reduce swelling. The recovery period can last several weeks, and most patients see final results after six months. The cost of a tummy tuck in Florida will vary depending on the extent of the surgery. Many other fees may contribute to the overall cost including anesthesia, the surgical facility, and any medical tests and prescriptions you may need. At the time of your consultation with Dr. Samson, you will be provided with a detailed written summary of the total costs of surgery, individualized your needs and desires. To achieve a more complete and harmonious look, many patients opt to have another surgery performed in conjunction with tummy tuck surgery. These procedures include a breast lift, breast augmentation, breast reduction, or liposuction. 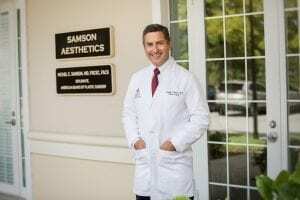 If you are considering any of these procedures in the Daytona Beach, Florida area, you can schedule a consultation with Dr. Samson. Please call 386-756-9400 or fill out our contact form today.